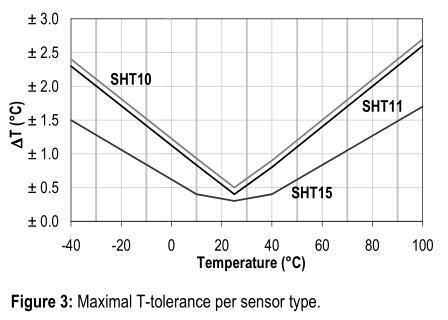 SHT1x (including SHT10, SHT11 and SHT15) is Sensirion’s family of surface mountable relative humidity and temperature sensors. The sensors integrate sensor elements plus signal processing on a tiny foot print and provide a fully calibrated digital output. A unique capacitive sensor element is used for measuring relative humidity while temperature is measured by a band-gap sensor. The applied CMOSens® technology guarantees excellent reliability and long term stability. Both sensors are seamlessly coupled to a 14bit analog to digital converter and a serial interface circuit. This results in superior signal quality, a fast response time and insensitivity to external disturbances (EMC). 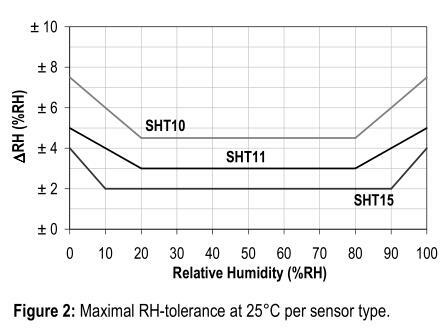 Each SHT1x humidity sensor is individually calibrated in a precision humidity chamber. The calibration coefficients are programmed into an OTP memory on the chip. These coefficients are used to internally calibrate the signals from the sensors. The two-wire serial interface and internal voltage regulation allows for easy and fast system integration. SHT1x is supplied in a surface-mountable LCC (leadless chip carrier), which is approved for standard reflow soldering processes.